Parapet wall construction has long history originally parapet wall was used for defensive purpose only. But in modern day construction it becomes the part of commercial building codes served for various purposes like as a guard rails, protection against fire spread and for the safety of anyone on the roof. Parapet walls also help to increase the wind uplift resistance of high rises commercial buildings, condos or private house roofing to keeping wind damages low. Tetra Construction Corp. is your premier general building contractors having long success record of serving home owners, property managers, listed buildings and more. Whether you want parapet wall repair, parapet wall rebuild or demolish services in New York City and Tri-State Area, we can help you with no obliged on-site inspection and free estimates. Parapet Wall serves as aesthetically pleasing guard rails and protective barrier. 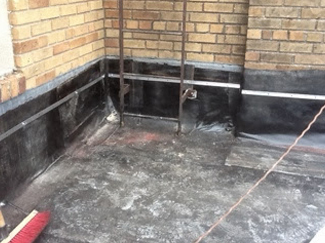 Water infiltration caused many structural repairs. When you feel parapet wall getting bend or water seepage on upper floor of the building either private house or commercial, you must consult with your general contractor to avoid further water leakage problem. After thorough inspection it will decide either you go with parapet wall or you need to re-build to resolve this issue. When you need parapet wall installation, repair or replacement services in Manhattan, Queens, Bronx, Staten Island and Brooklyn or anywhere in Greater New York, contact Tetra Construction Corp. and get reliable and cost-effective solution your needs. We provide full parapet wall services from parapet roofing, to parapets firewall and bridging parapets to any structure for residential to commercial and industrial. We are insured and certified roofing and waterproofing contractors provide quality services fully compliance with OSHA safety standards and building codes. Seek expert advice on parapet wall in NYC? Call us and set your meeting with our professional who inspect and accurately diagnose problem. Tetra Construction is the name of quality, reliability and professionalism.